While threats to network and information security have existed since the dawn of the information age, the complexity and scale of attacks have exploded in recent years, presenting enterprises with daunting challenges as they struggle to defend an increasingly vulnerable perimeter. This paper assesses the current cyber threat environment and discusses the use of distributed cloud services as an effective means to protect against evolving, modern-day IT threats. 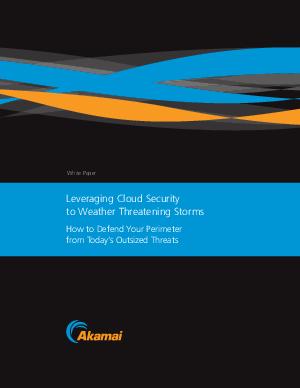 It takes a close look at DDoS defense in particular, and provides action-able strategies for leveraging cloud security services to provide a robust layer of defense in an increasingly threatening Internet environment.